This rugged, accurate heavy duty industrial indexing mitre cut-off saw uses our time tested 200 series sawhead. It will mitre up to 60 degrees each side of 0 degrees, with positive pin stops at 90º 45º, 30º, 22½º, 15º,0º. Blade Capacity: 14" OD 356mm standard. Iron Castings Base & disc: are made from precisionmachined iron castings for lasting accuracy. Disc isset flush with table and graduated each degree. Dust Outlet: Two 2" dust outlet provided. 600 CFM required for each. Cutting Capacity with fences: Set at center line45° Mitre Maximum Cutting Capacity 5" 127mm High x 5" 127mm Wide. 90° Straight Maximum Cutting Capacity 5" 127mm High x 6.625" 168mm Wide. 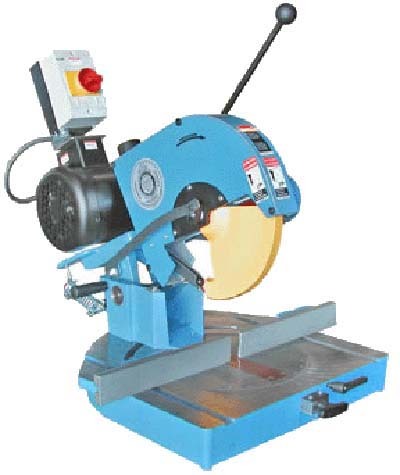 Maximum Cutting Capacity: 45º Mitre Maximum Cutting Capacity 5" 127 mm High x 7.5" 190mm Wide. 90° Straight Maximum Cutting Capacity 5" 127 mm High x 9" 229mm Wide.